Harvey P. of Yellow Springs Ohio hired SunRock Solar to install a photovoltaic array in his backyard using a seasonally adjustable pole mount system. 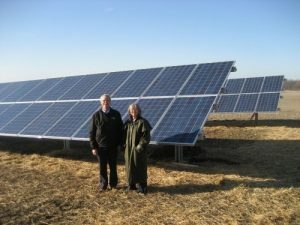 The installation was completed on May 3, 2011, so the system has been in production for about a year. We interviewed Harvey about his panels and the pole mount system. Fifteen 230-watt modules for a system rating of 3.45 kW. What percentage of your utility is being covered? How much have your utility bills gone down? I am covering 100% of usage, but we were not big users. Our electric bill is now $10.00 per month, covering the first 100 kWh, which I never use. Now that it has been running for awhile, have you figured out how long it will take to pay it off? How many SRECs have you produced? Slightly less than 4 MWh at this point. You decided to use a pole mount system. Why didn’t you put the panels on your roof? More shading from neighbors trees than was the case with the pole mount. Why didn’t you use a regular ground mount system? I wanted the option of “following” the sun during the seasons, and also the pole mount left more gardening space than a ground mount would have. Do you think the pole mount system has helped your production? Yes, based on a comparison with a roof-mount array located nearby. The steep winter tilt also helps prevent snow build up on the panels. Are you satisfied with the production? Yes. Is the tilt mechanism easy to adjust? Yes, very easy. How often do you need to adjust it? I usually change the setting twice a month, and sometimes more often if I am showing the installation to someone. Have any issues or problems developed? No. Have you had any major storms hit your area? Hail, or high winds? There has been some small hail and fairly high winds. The hail caused no visible damage and the wind caused the array to shake a bit, but not enough to cause worry or damage. Are you satisfied with the work that was performed? Very much. What other things do you do at your house to reduce your energy costs? We have new appliances, all energy star, and most of our lighting is with CFLs. We are replacing our windows to decrease air conditioning load, the only possible use that would exceed our production enough to use our “banked” production. Are the panels producing enough energy to handle your house and charge up your electric car? Do you monitor your usage more now that you have panels installed? Has it made you more aware of what you are using? No, I have kept a spreadsheet of usage for several years. But I do enjoy following the solar production using the online monitoring. 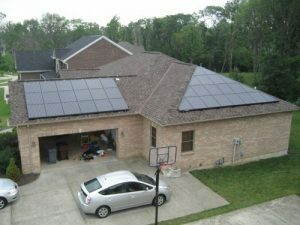 Are you glad that you had solar panels installed at your house? Berkeley National Laboratory just released a report entitled “An Analysis of the Effects of Residential Photovoltaic Energy Systems on Home Sale Prices in California.” The study was funded by the US Department of Energy. The main focus of the study was to determine whether homes with installed PV systems sold for more money than comparable homes without PV. The authors studied 72,000 homes in California of which 2000 had PV systems installed when they were sold. The research found that homes with PV systems in California have sold for a premium compared to homes without PV. When the sale prices were compared to the size of the PV systems installed, the average home sale price was $5.5/Watt with a range of $3.9 to $6.4/Watt. This is higher than the homeowner’s original investment on the installation which averaged $5/Watt from 2001 to 2009 after all the state and federal incentives. When the authors studied the relationship between new and existing homes sales prices they found an interesting result. The new homes showed a premium of $2.3 to $2.6/Watt while the average premium for existing homes was $6/Watt. 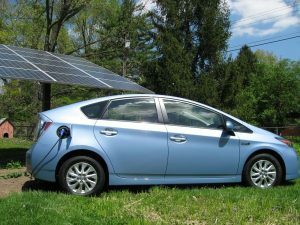 The authors blamed this disparity on the fact that the homebuilders install photovoltaic systems on their new homes as a standard, and possibly accept a lower premium to sell the houses faster. The last part of the study compared energy cost savings of the homeowners to the sales price of the homes. When the results were expressed as a ratio of the sales price to the annual electricity cost savings associated with PV the average was around 20:1. This means that for every $1000 saved in energy, the houseswith PV systems sold for $20,000 more than a house without a PV system. This was the average for existing and new homes. The averages for both ranged from 7:1 to 31:1. The authors of the study showed that, in California, having a PV system installed on your house will increase your home’s sale price. Marcia and Michael Eason’s solar system was featured on the front page of the Home and Style Section of the Cincinnati Enquirer on Saturday, September 25th. SunRock Solar installed the system in July of 2009. The Easons live in West Chester. Their house was highlighted because it is part of the 2010 Solar Tour Organized by Green Energy Ohio. The Solar Tour takes place this weekend, October 2nd and 3rd. If you are interested in participating in the solar tour to see more of SunRock’s installations around southwest Ohio check out the website to organize your own personal tour.